Windows 8, like Android and iOS, features an apps notifications function, alerting you when you receive new messages, calendar events and email. Unfortunately, Microsoft offered users scant options for silencing those notifications. You could either shut them off for a few short ours, or turn them off entirely. 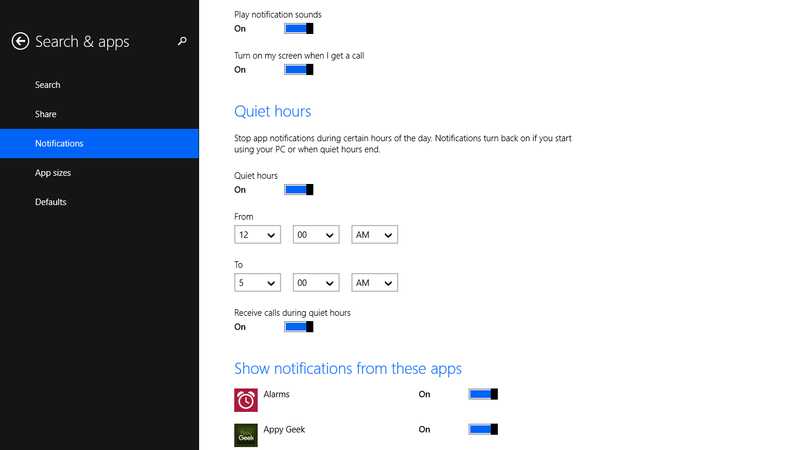 Thankfully, Microsoft has rectified this omission, adding a new Quiet Hours function in Windows 8.1 that lets users schedule when notifications should be active and when they shouldn’t. When enabled, Quiet Hours ensures your notifications don’t make any noise or cause the screen to light up when your Windows 8.1 device is in sleep mode. Your notifications will automatically be restored whenever you start using your device or Quiet Hours are over.